Capcom's legendary Street Fighter franchise is nearing the 20 year mark, and its influence over electronic games over these past years has been immense, spawning numerous imitators and initiating numerous spin-off series. The best of these was the Alpha series of games, which introduced several enhancements, such as the isms, which allowed players to select from three different super-gauge systems, in addition to smoother, more balanced play. This package includes four of these titles, including SF Alpha, SF Alpha 2, SF Alpha 2 Gold and SF Alpha 3. Each game on the package is a nearly flawless emulation of the original arcade package, and this compilation is also interesting for gaming historians, since it allows you to trace the evolution of the series, from its promising origins to its highly polished, tuned conclusion. The first game on the package, the original Street Fighter Alpha had a number of cool ideas. 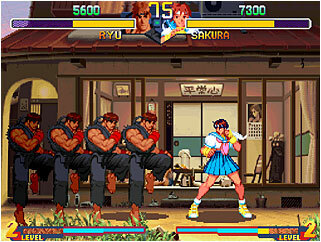 Set before the events of SFII, the game featured many of the familiar characters, which a younger, fresher appearance. The game's brightly colored backgrounds and fluid animation set the tone for the rest of the games that followed. 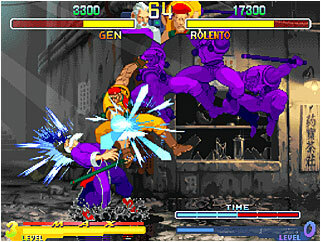 SF Alpha 2 added additional characters and refined the fighting system to create an even better balance between the games. SF Alpha Anthology also includes and enhanced edition of Alpha 2, Gold which adds additional characters, backdrops and refined moves listrs. By the time Alpha 3 arrived, the series was in full effect, with dozens of playable characters, multiple modes of play along with dozens of options and extras to create a game with incredible depth and nuance. Each title featured incredible presentation, which became increasingly elaborate as time went along, until the third installment created what is probably the best 2D fighter, and the highlight of all the SF games to date from any series. We don't have time or space to outline all the games' features and various options here, but the depth and sophistication that's evident in each game means they have an almost unlimited replay value. In addition to the standard fighting modes, Capcom also implemented a number of cool features which allowed players to fight only bosses, team up with other players, play through tournaments, set up practice sessions, explore the world of Alpha and earn other items, unlock bonus characters and much more. While the number of characters in each game is impressive, the total roster of all the characters in the game reaches almost 70, with every major character in the original series represented, giving the player plenty of depth. The different isms definitely play a large role in how the game is played, giving the player an almost unlimited number of options. The elaborate gauge system is ingenous, since using a different Ism makes playing the same character feel almost completely different. It allows you to play the game with your own unique fighting style, giving the player a sense of ownership and freedom other fighting titles have emulated, but few have equaled. Obviously, a key part of the SF formula has always been player identification with their chosen characters, and while they do change some minor aspects over the course of these games, they remain largely consistent, with their trademark moves and attacks fairly uniform throughout. 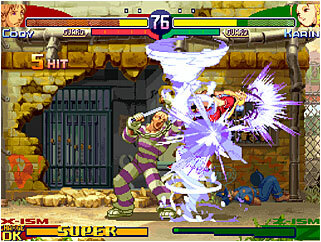 Another key aspect of the Alpha series' appeal lies in its various modes and variations, with Dramatic Battles, Versus and other modes implemented throughout the games. It gives you plenty of variety and sprinkling different objectives on each mode adds even further to the game's replay value. While the games themselves seem similar on the surface, as you delve deeper into the games, the changes are more significant than adding a few new characters with each installment. Playing the first and then the third installments back to back reveals how much a difference small changes make. While the tweaks and additions might seem small and minor on the surface, these changes add up to make the third game feel much smoother, deeper and satisfying than the first, which shows other developers how to make sequels. Those players experienced with the Alpha games should have little problem jumping right into these nearly flawless editions, and even those who might have skipped out on them now have the opportunity to catch up on these brilliant titles, conveniently collected and attractively priced. As an added extra, Capcom has included Super Gem Fighters Minimix (originally released as Pocket Fighter), a cool kiddie-oriented Fighting game featuring characters from outside the SF universe. They're all deformed an exaggerated here, but the game plays solidly with some interesting play mechanics that makes it a cool addition to this release. All of the games are solidly implemented and the package is one of the best compilations Capcom has released, and is a much better, more cohesive representation of the series excellence than some of the haphazard releases. The biggest offender was Street Fighter Anniversary Edition, an awful attempt to shoe-horn various Capcom characters into the franchise, without updating their animations and with little attempt made to adjust the balance. It was a good idea on paper, but its terrible implementation made for a game that was extremely painful to play for anyone who cared about the series. Luckily, Capcom seems to have atoned for that atrocity this time. From a technical standpoint, this package is excellent and works nicely. The controls work fine with the standard PS2 controller, but obviously an arcade stick adds authenticity to the gameplay. The Alpha titles' have been reproduced incredibly faithfully on the PS2, with each frame and animation brilliantly come to life. The games load very quickly from the disc, but players who own the PS2's hard drive can also load SFA Anthology for nearly instantaneous gameplay. While its tempting to say these titles represent a nostalgia kick, their immediacy and accessibility make them feel as fresh and fun as they did when they were released. The fact that very few of today's modern 3D fighters have yet to approach the sheer silky smoothness of these titles adds to their timeless appeal. This is an exceptional package that brings together some of the finest moments in Capcom's glorious 2D fighting history and should be a solid addition to your collection.